Every single one of these hats has been masterfully crafted in the esoteric style that is Steampunk. Here, you will find all manner of styles of hats, all decidedly Steampunk. Whether you are looking for a ladies riding hat that has gizmos and do-dads on it or a gentlemans top hat fitted with the latest and greatest of cogs and gears, you'll find it here. Esoteric and wonderful, these attractive hats are wonderful compliments to almost any Steampunk look. 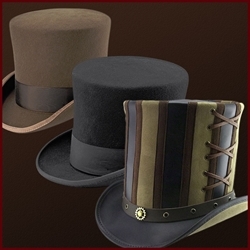 Do not be fooled by any pretenses of formality or high-society appearances, because whether you are a brilliant Steam engineer, a greasy Steam-machine mechanic, or a high-society aristocrat, these hats will work wonderfully with almost any ensemble. Many of these hats also feature designs that would make a Steampunk aficionado giggle with glee, as gears, cogs, goggles, sprockets, keys, and other technological features adorn many of these hats, elevating them from the realm of being simply classic to superbly Steampunk. Inspired by the legendary spirit of the same name, this Absinthe Stovepipe Top Hat is a perfectly eccentric compliment to a fearless wardrobe. It is handcrafted in the US from the finest leathers, and features exotic details like corset-style leather lacing up either side. Made in the USA from linen, this spitfire style cap features 8 panel construction and a soft brim. Available in sizes small (6 3/4), medium (7 1/8), large (7 1/4), and extra large (7 1/2). This Black Leather Top Hat comes unadorned and ready for you to style. From Victorian to Western, this sturdy hat will see you safely through your travels. The 5.5 inch crown and shapeable brim are ready for you to add a hatband or accessories, or wear plain for a classic look. Made in the US. A hybrid style, a blend of military and casual, the Black Felt and Leather Cap is an eye catcher! Hand made in the US. Our Black Victorian Top Hat is hand-crafted in the U.S of wool felt. Perfect for any Victorian or Steampunk outfit. The working stiff's lid. The Bromley Leather Hat sports a practical, streamlined brim and a low, wide crown. The carriage hat band's bold brass buckle provides a utilitarian accent. Hand made in the US. This Dragon's Eye Leather Top Hat is made in the US from the finest materials. The laser engraved and airbrushed hatband features a dragon's eye and antiqued brass buckle. A breathtaking showpiece, the hatband is removable for those times you require a more low-key topper. This Dragon's Eye Leather Top Hat in Berry is made in the US from the finest materials. The laser engraved and airbrushed hatband features a dragon's eye and antiqued brass buckle. A breathtaking showpiece, the hatband is removable for those times you require a more low-key topper. This Brown Leather Top Hat comes unadorned and ready for you to style. From Victorian to Western, this sturdy hat will see you safely through your travels. The 5.5 inch crown and shapeable brim are ready for you to add a hatband or accessories, or wear plain for a classic look. Made in the US. A hybrid style, a blend of military and casual, the Brown Felt and Leather Cap is an eye catcher! Hand made in the US. This suede leather cap style designed by Ruby Roxanne features a subtle yet powerful hatband riveted in place with a metallic pearl button. This Grey Victorian Top Hat is constructed of luxurious wool felt and is hand-crafted in the U.S. Perfect for any Victorian or Steampunk outfit- they look great topped with our goggles. Made in the US, this Leather Dragon Top Hat features a multicolored, airbrushed 3.75 inch crown with a fearsome laser engraved dragon. Included is a unique “scaled” hatband, a shapeable brim, and a truly artistic presence. Festive but firm, the all Leather Carnival Top Hat in Cherry features an airbrushed vertical stripe pattern between two layers – perfect for the carnival lover or the fashion conscious. Hand made in the US, this hat has a 3.75 inch crown and a 1.75 - 2 inch shapeable brim. A dapper topper with an exquisite, patterned fabric crown, the Gent Leather Top Hat is a classy, modest addition to our Steampunk Hat line. The intricate vine pattern that winds around the crown, and the luscious, fawn brim give this hat an understated elegance. Sail the breadth of your domain and never fear the edge of the world in The Hatlas Leather Hat. With a black leather 2 inch brim, and a 5.5 inch crown laser-etched and airbrushed with pure discovery, this mid-top wonder is ideal for sailors, explorers, or cartographers. Hand made in the US. This Garter Band Top Hat features pecan colored leather, paired with a contrasting brim edge. The laser-engraved band allows a naughty peek of lace that causes the unprepared to blush. Petticoats or jeans, your look is complimented by this topper. Handcrafted from thick, rich leather, the Folsom Hat features the low and tight dimensions of a classic pork pie style. Made in the US. The El Dorado Top Hat in Black is made in the US from top quality leather. It hearkens back to the Old West and looks directly at the future with a powerful profile, shapeable brim, and 4.5 inch crown. Adorn it as you'd like, or leave it spartan so as not to mar its natural beauty. The El Dorado Top Hat in Brown is made in the US from top quality leather. It hearkens back to the Old West and looks directly at the future with a powerful profile, shapeable brim, and 4.5 inch crown. Adorn it as you'd like, or leave it spartan so as not to mar its natural beauty. With a 4.5 inch tall crown and simple band, the El Dorado with Buffalo Band can easily be dressed up or down. The luster of its full-grain, smooth leather is complimented by a shapeable brim, for a personalized attitude adjustment. Hand made in the US with buffalo nickle style adornments. With a 4.5 inch tall crown and simple band, the El Dorado with Buffalo Band in Brown can easily be dressed up or down. The luster of its full-grain, smooth leather is complimented by a shapeable brim, for a personalized attitude adjustment. Hand made in the US with buffalo nickle style adornments. This Leather Dragon Top Hat is made in the US from the finest materials. The hatband features a dragon's face laced closure. A breathtaking showpiece, the hatband is removable for those times you require a more low-key topper. Leather Top Hat, the Havisham; a lace and leather top hat with enough elegance to turn heads at the dance, while maintaining just the right hint of danger and mystery. Our Steampunk Leather Top Hat is a Steampunk style Leather Top Hat that is fully shaped and accented with antiqued silver studs. This Top Hat is a great accessory for your steampunk costume or clothing. Our Leather Top Hat stands 4.5 inches tall. This Pecan Victorian Top Hat is constructed of luxurious wool felt and is hand-crafted in the U.S. Perfect for any Victorian or Steampunk outfit; they look great topped with our goggles. This Gent Half Top Hat is a luxurious short top hat that is constructed of wool felt and is hand crafted in the U.S. Perfect for any Victorian or Steampunk outfit. Made in the USA from wool felt, this derby hat features a sleek, curved brim. Available in sizes small (6 3/4), medium (7 1/8), large (7 1/4), and extra large (7 1/2). This Velvet and Leather Top Hat in Brown and Burgundy has enough elegance to turn heads at the dance, while maintaining just the right hint of danger and mystery. Decked with hand-worked leather, velvet, and a curiously beautiful accent piece front and center. The Pale Rider Hat is sharp in finished black leather and a polished skull hatband. You can wear this hat on the bike, or around the town; it's simple enough to be worn with any wardrobe. Made of full grain leather with exposed stitching, this dashing Peacekeeper Hat has a breathtaking design. The replica handguns and miniature polished buckle along the crown will completely blow you away. And for the final touch, the bullet band will keep the people around you always on their toes. Made in the US. Hand made in the US from top quality leather, this Skulls N Roses Topper features a laser engraved, airbrushed crown and matching black hatband with 3 skull conchos. The Stove Piper Hat is made in the US from quality leather. This tall topper's crown measures a glorious 6.5 inches! A stovepipe hat is the symbol of one of our greatest presidents, so why shouldn't you wear one and feel the grandeur as well? Control time (at least in your wondrous imagination) with a mid-crown top hat we call The Time Hopper Leather Hat in Black. Fully-equipped for any and all situations the discerning yet adventurous time-traveler may face. The bullet-belted, hand-tooled band holds six cartridges, two elixir bottles, and the key to your time machine. Control time (at least in your wondrous imagination) with a mid-crown top hat we call The Time Hopper Leather Hat in Brown. Fully-equipped for any and all situations the discerning yet adventurous time-traveler may face. The bullet-belted, hand-tooled band holds six cartridges, two elixir bottles, and the key to your time machine. Function in fashion, the Trinket Leather Top Hat features an ageless timepiece with visible movement & a monocle for reading the evening Gazette. The ammo and potion bottle hatband completes the package. Made in the US. Leather Top Hat in Brown is a full-grain quality leather Top Hat or (topper). Each of these leather hats is handmade and embellished with a cotton canvas and leather band, giving this steampunk Top Hat a rugged twist. Leather Witch Hunter Hat in Brown is a full-grain quality leather Hat. Handmade and embellished with a buckled cotton canvas band, gives this larp Hat a rugged twist. Pierced leather stitched around the crown makes this a very durable hat. Leather Witch Hunter Hat in Black is a full-grain quality leather Hat. Handmade and embellished with a buckled cotton canvas band, gives this larp Hat a rugged twist. Pierced leather stitched around the crown makes this a very durable hat. The Feedback Top Hat is a new design by renowned tattoo artist Adam Rose of Fallen Owl Tattoo Studio, Feedback is for everyone from the dedicated rock and roller to the Delta bluesman. Impeccably designed!